Richard brings to life spectacular dogfight over Eisenach on 24 March 1945 when the doughty Clyde East, returning from a recce over Schweinfurt and with photos already in the can takes on a group of six Me109’s. Flying his legendary ‘Lil Margaret and having already dispatched one, he peels round to line up his second Me109 to add two more victories to his remarkable tally. 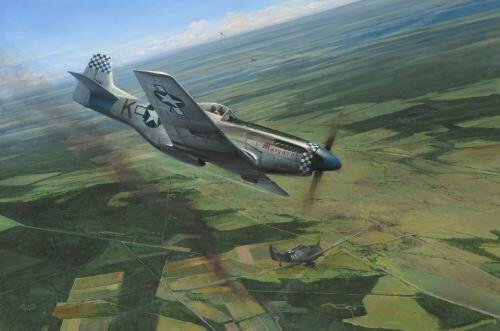 Every print in the exclusive FOUR signature edition has been additionally signed by three additional P-51 fighter pilots, including two Aces, who flew combat in Europe during WWII.